I loved Daz 3, but here in DAZ 4 I can't do anything. It feels like you took a step back, and I can't find where to get DaZ 3 again. If you haven't archived the installer...maybe, you can if you contact DAZ during regular business hours (by phone, is probably best). But what are your problems with 4 (and is it 4.0 or 4.5...because there are quite a few fixes in 4.5 and some changes...especially the inclusion of Darkside style, instead as an optional installer)? Normally Studio 3 should still be available in your order history along with any plugins you might have bought for it. This is what I love about this site, how everyone jumps at the chance to help someone else having a problem. Kudos to all of you heartfelt people in Dazland. We newbies appreciate you and all your time you seemingly give. I'm primarily a Poser user, and even I know that DAZ 4 isn't remotely "a step back". It's just a different interface to learn, which can make it hard to get used to, but that's far different than a step back. It's just a different interface to learn, which can make it hard to get used to, but that's far different than a step back. The main problem is that it's a very different interface, with some default settings that are... less than optimal. Can you read sideways? Also, the old Classic setup is no longer an option (which I consider one of the worst features of 4.0 and 4.5) and all we can do is fiddle with things until we get as close as possible. It doesn't help that a clean install on a machine that's never had DAZ|Studio on it before will usually give you a basic, stripped-down, incomplete interface — and doesn't tell you that. The horribly misnamed "Full Service [Beta]" layout has left many people on the verge of tossing the whole thing out because "stuff doesn't work" and they can't find anything. I hate to think how many did give up in frustration because they never came here to the forums to ask questions. At first, when DS 4 came out in public beta, I hated the interface as I felt it was more like Poser (which I dislike). What kept me at DS 4 was 64 bit version for Mac OS X (DS 3 was only 32 bit for Mac OS X). Then I started to like DS 4 more and more and when I went back to DS 3 it felt slow and kludgy. Now with 4.5 I see no turning back as 4.5 really is smooth to work with, much faster then DS 3 ever was and I got a wonderful workflow with .duf-files, which I think is really good. I said it before, but if you have two machines, let machine B hook up to machine A's runtime over the network, and to your disk/directory where you save your work files. Then open the scenes on machine two, and render! No more .daz files with broken links to private files in /data. Just my opinion, but we all have different workflow. I use both DAZ3 and DAZ4.0. But I am a self taught 3d artist/hobbyist so workflow (as I understand it) is not a concern for me. It is a real pleasure to mix and match my legacy clothes on Genesis since I installed the legacy shapes. I like DAZ 3 to work in. It's less confusing. . But DAZ4.0 has 2 advantages that I like, once I figured out the "rules". The first rule is choosing the right tab and making sure the right figure is highlighted. If the figure is not highlighted the search is automatically constrained to what was last highlighted which I DO NOT LIKE!. I think searches should be according to what I want to look for, not what I have selected. It's annoying to look for a body pose when still in Wardrobe tab with the shoes highlighted in Scene. Won't find it. Of course, got to have ready access to Readme's help with those crazy file names. If you have Lady Batavia Ghost Thunder hair, the files can be named any kind of abbreviation, often including the artist's initials, so you'd be looking for Ralph Zeem"s Lady Batavia etc etc. RZ_LB_G_Thn.hr... or whatever. I'd be lookin' for "Thunder Hair", LOL! I guess that was what Smart Content was for but it's not helpful with purchases from other vendors. Yay for "browse to file location" so I can figure out the path when Content Library only finds part of an item. 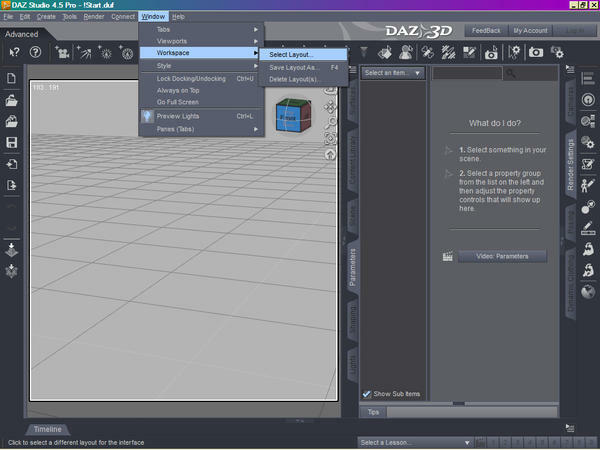 On the other hand I can find or import to DAZ4.0 without having to rebuild a metadata library--what a relief! I'm retired from a job of repopulating new databases, so I rather not. If there is metadata, fine, it'll show up in the metadata panel. I close that panel after "shaping" Genesis to V3 or V4. I usually work with just the right hand panel which is most similar to my DAZ 3 workspace. The second rule: Make sure the "show extentions" box is clicked (I forget where that is, sorry) or it is a dismal nightmare looking for anything in the Content Libary. Thank you! I'm an old DAZite but I too found the "clean install" of DAZ4 to be most unsatisfactory and ill conceived. I have DAZ4 and have had it installed "cleanly" on a spare Win7 system but I just finally gave up. I am very very happy playing in DAZ3 mud with my old non-Genesis toys. ...basically what I plan to do on the new system is first install Studio 2.3, then 3.1.2 (64), then Poser8 and Pro 2012 (64), set up all my runtimes, then install 4.5 (64) afterwards followed by all Genesis oriented content (including plugins like GenX and the various "legacy" body shapes) and finally map all the other previously installed runtime folders in the Edit/Preferences pane. Another thing if you don't like the horizontal scrolling you can opt for the conventional "tree" display (but you must select this in each of the tabs individually). Also the "Darkside" UI skin (which is free) helps to make the display look and feel a bit more like the older UI. Also the "Darkside" UI skin (which is free) helps to make the display look and feel a bit more like the older UI. Actually, Darkside is now included in the main install, no need to download/install it separately. With GenX however, that has changed as I can now load the morphs I used from the various Gen4 characters like the Steph4 NPMs and V4 Young FBM. I actually feel she looks more like the character I envisioned than even the Gen4 versions I created as I am also able to mix in a bit of other body shapes like "Basic Child" and believe it or not, even "Mavka" (to get that more narrow hip pre-teen physique). Alas Steph 5 didn't work as there are only three basic body shapes none of which work for a younger character, and no Petite FBM like the Gen4 version has. Basically I use Genesis for the improved bending and ability to freely mix figures/morphs which was not possible in earlier version of the application. The 3Advanced figure mixer, while an interesting concept, only worked with models that shared the same "unimesh" and the resulting character ended up with the full poly weight of whichever figures were combined. With Genesis I can mix aspects and morphs of toon and realistic together (as well as trade clothing between them) and with GenX, I can add only the Gen3/Gen4 morphs I need for a given character. I find that to be much more efficient. Your posts can be very informative Kyoto Kid. I have learned quite a lot from them. The problem I do have reading your posts though are the fluttering butterflies below. As I read your post my eyes always scan down towards the movement below which makes it difficult to read. I don't know if this has bothered anyone else or not, but if you have a large paragraph it seems to take forever to read it because I keep looking down. I just thought I would say something and it could be just me and my eyes from staring at a monitor for hours on end. You can still use your studio 3 content in studio 4, just like before. You don't need to use Genesis, v4/m4 and all other things still work. There are also a few morphs available for free on ShareCG, but I don't have any of them so I can't say what they're like. Most seem pretty nice. With those two packs, you nearly equal the versatility (maybe, in some areas...surpass) of the Evolution packs...plus they are very well done.